Weaving BYU traditions with a love story, a student film from 1971 comes to YouTube. The year was 1970 and young people flocked to see a melodramatic movie called Love Story. A year later several BYU communications majors took their inspiration from that film and produced their own starry-eyed tale called Ice Cream and Elevators. It began when BYU student body vice president of culture F. Russell Wood (BA ’71) asked his broadcasting class to help him find a way to embody student life and campus traditions—both formal and informal. Classmate Robert D. Starling (BA’71), now owner of Trefoil Productions, became producer and gathered a team of students that included the late D. Dean Stubbs (BA ’71) as director and G. Dewey Pratt (BA ’71) as cinematographer. The film highlighted traditions such as buying ice cream for roommates after a first kiss and hanging out at Heaps of Pizza (now Brick Oven), then the off-campus haunt of thousands of students. 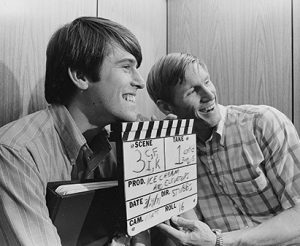 Eric Johnson and Robert Starling (above) pose on the set of the 1971 student film Ice Cream and Elevators. Dewey Pratt and Dean Stubbs (right) roll film on Johnson as Starling follows the script. 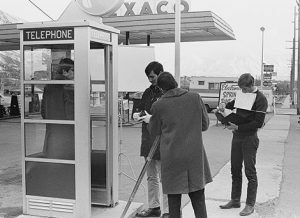 When Ice Cream and Elevators was premiered May 6, 1971, the 28-minute movie—BYU’s first student film made for class credit—drew 6,000 people to the Smith Fieldhouse and then subsequently played in the Varsity Theatre until the end of the term. “We advertised with flyers on mimeographed paper and ran searchlights in front of the fieldhouse,” says Wood, who served as the film’s executive producer and is now retired from KSL Broadcasting. President Ernest L. Wilkinson (BA ’21), in one of his last appearances as president of BYU, drew the biggest laugh with his cameo as a janitor in the final moments of the film. The concept for the film began as a brainstorm by Janet Maughan Coleman (BA ’89) and Ronald W. Davis (’72). Ronald J. Clark (BA ’72), BYU’s current director of Public Affairs and Guest Relations, wrote the screenplay. Coleman, who lives in Houston, was tapped to play Sue (the female lead), and J. Eric Johnson (BS ’75), now a regional marketing manager in California, was cast as Jerry (Sue’s suitor). Ice Cream and Elevators tells the familiar story of boy gets girl, boy loses girl, boy gets girl back. In a nod to Love Story, it features both a happy and a sad montage. In the Hollywood picture, when the love-struck young man comes home from his date, several roommates are playing poker; in Ice Cream and Elevators, it’s a Mormon-trivia card game. Multiple courtship scenes play against dreamy music of the early ’70s. Since the road to love is often rocky, conflict arises when Sue’s newly returned missionary begs her to see him before making her decision about Jerry. Misunderstandings surface, and Sue and Jerry suffer until they reunite by chance in the Wilkinson Center elevator. The film portrays traditions now firmly entrenched in nostalgia, including the frustrations of registering for courses using punch cards in the Smith Fieldhouse, looking up schedules in oversized binders, and racing to class to avoid stopping for the national anthem. Nowadays registration is online, and while the flag ceremony and anthem are still part of BYU life, they no longer collide with the beginning of classes. According to Starling, the film crew had to beg, borrow, and rent equipment. “It was so primitive, we could have called it guerrilla filmmaking,” he says. They used a spring-wound 16-millimeter camera that could shoot only 24 seconds before running out of steam. Not surprisingly, many scenes are short. Wood obtained funding from the Culture Office to rent a lip-sync camera and recorder for one day, and he remembers many hours spent splicing and dubbing film in the basement of the Harris Fine Arts Center. “We were thrilled the student body loved it, and I still look back at it with great fondness,” says Wood. Video: See BYU’s 1970s love story: Go to magazine.byu.edu/71film.